Voie Verte - Green Cycle Route - Atlantic to Mediterranean ! This is fantastic - You can cycle the whole way from Bordeaux near the Atlantic to the Mediterranean Sea along green cycle routes (voies vertes) and canals. There is lots of information and maps available at http://www.canal-et-voie-verte.com/index.php. You could do all or part of it. There are not really any campsites from Eurocamp and Keycamp en route though. There was an accident at Disneyland Paris on Monday 25th April 2011 with one man seriously injured and five others with minor injuries. The accident took place on the Mine Train attraction. A piece of artificial resin rock fell off onto the train track, causing a train to derail and rise up and land on a carriage carrying 25 people. The injured man was airlifted to hospital and lets hope he recovers. The attraction has been closed for the time being. is this something that could have been avoided ? Should they not be inspecting the various parts of a ride to check that there is nothing that is working loose and needs repaired or replaced, especially those parts near moving things like trains. Or is this just an unfortunate accident that couldnt have been foreseen ? I tend to think that this should have maybe been foreseen. All I can say is thank goodness I am usually too scared to go on most rides such as rollercoasters - mind you I can imagine that that mine train looks like the type of thing I might possibly have been persuaded to go on. Update (6th June 2011) - there was recently an accident where a young girl fell out of a ride at Parc Walibi in the Rhone Alpes and it turns out that a teenager was injured when he fell out of this ride in 2003 - http://www.francesoir.fr/actualite/faits-divers/walibi-un-ado-deja-blesse-dans-meme-attraction-107847.html. The accident with the young girl is attributed to the fact that the safety barrier wasnt holding her in due to size different between her and her aunt who had taken her on the ride. Lets hope she is OK. If you are planning to work while you are in France and need to brush up some of your business French then here is a great French language course from the French broadcaster RFI. Its based around the adventures of "Daniel", a foreigner who has taken a job with a French company in Pairs. There are 20 episodes covering all aspects of business. Here are some interesting statistics from the Federation Francaise de Camping et de Caravanning (FFCC). Camping is the No.1 type of holiday in France with the most numbers of "tourist beds"
French camping is the 2nd largest in the world after the United States. France is the most popular place in Europe for camping. There are 6 million French campers and 2 million foreign campers who come to France each year, with the majority being Dutch, Germans and British. Camping in France employs more than 13 000 permanent employees in 10,430 campsites. There are 83,051 mobile homes available for rental. Campsites are currently graded in a star rating rather like hotels. Basic campsites, perhaps offered by a farm, might have for example just shower and washing facilities would have a 1 or 2 star rating, while if you stay in a four star campsite you might expect to find a restaurant, swimming pool, shop, tennis courts etc. The more basic campsites also tend to be smaller with 1 star campsites covering an average of 1.3 hectares while the 3 and 4 star campsites are larger, with the 4 star campsites covering an average of 5.5 hectares. The number of emplacements in France has increased from 165,000 in 1960 to 900,000 sites late 1980. Since 2005, camping has become very "trendy" or "chic" if we are to believe the media. There are all sorts of varied new types of accommodations on campsites to satisfy the demands of consumers - so you can now find such things as kids' tree houses, gypsy caravans, log cabins and yurts on campsites. A new system of classification of outdoor accommodation was launched on 1 July 2010 to replace the classification of 1993 which no longer reflected the quality of provision of campsites today. Professionals have until July 22, 2012 to comply. Plans are to have a new grading of "five stars" to keep up with some of the huge improvements seen on many campsites. I hope you have found some of these statistics interesting ! I didn't realise camping was so popular in France ! A Great New French Cookbook ! Well I have just indulged myself and bought another cookbook ! I love this one - I just saw it in Waterstones and had a look through it. Lovely photographs of France, great classic French recipes but modified slightly to include healthier ingredients. It also has a recipe for Macarons which I got a chance to make last year on a cooking lesson in the fantastic kitchens of the restaurant at La Garanageoire campsite in the Vendee ! Now I have the recipe there is no stopping me ! I will photograph my attempts once I get my recipe book in the post next week ! Wish me luck ! 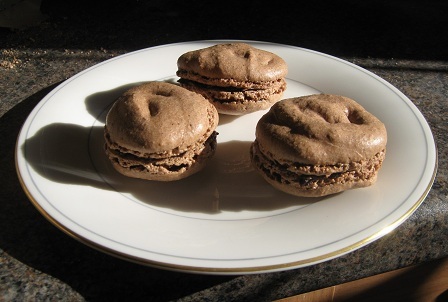 Well I am pleased to report that I managed to make a batch of very tasty chocolate Macarons ! They had just the right texture - just the right amount of chewy vs crunchy. This is really a lovely cookbook. Although its also too nice to get splashs of ingredients all over as well - most of my other cookbooks have a nice "used" look about them !